You are at:Home»Fashion»Style with True Savage Apparel! AP: When was Tru Savage established and what’s the motivation behind it? KF: Tru Savage Apparel was established January 1, 2017. It’s an activewear and urban wear clothing line. I started the clothing to seek my own entrepreneurship. I wanted the clothing line to be a part of me. That’s how I came up with the name Savage. Savage was a nickname given to me because of the way I played sports. AP: I love that it’s bold and confident. What set’s Tru Savage apart from other clothing brands? KF: To me the main thing that sets Tru Savage apart from other clothing lines. Tru Savage is a way of life. People are going to see the word Savage and think the worst. The Savage mentality is how I approach every obstacle and goal. I’m untamable, eager, and ferocious when it comes to something I really want. So, I want the customer to apply that same energy to their everyday life or goals in general. AP: What’s your must- have piece from Tru Savage Apparel? Why? KF: The must-have piece is the track pants, soccer shirt and the ladies activewear jacket. The material is so comforting and it’s something that you buy and literally wear once a week. People always tell me how much they love these items once they buy them. 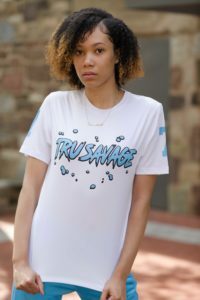 AP: Is Tru Savage Apparel available all four seasons, or is it only available during the summer? KF: Yes, the clothes are available all season. I have spring, summer, fall, and winter gear. AP: We all love Tru Savage Apparel. Where can we find and purchase it? KF: My website is www.Trusavageapparel.com. I’m also on social media. Facebook and Instagram, just type trusavagapparel. Make sure you go follow me. AP: What’s next from Tru Savage Apparel? KF: Clothes-wise I’m going to have some tracksuits, sweat suits, and running jackets for the winter. Business-wise I’m working on opening a storefront and gym where you can purchase the gear.